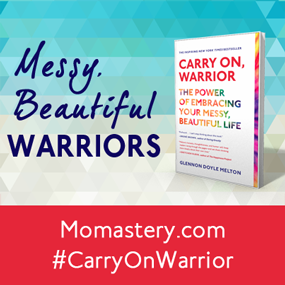 I had convinced myself not to write for Momastery's Messy, Beautiful Project. Then a little birdie sent me a little message. It was short and simple and sort of like a nudge. Maybe she meant for it to be or maybe she was just being kind. Either way, she said, "You never know which opportunity will be the opportunity that changes your life." Smart little birdie she is. Opportunities are like that, you see. They're often fleeting and gut wrenching. They take time to seize but can be gone in seconds. So, this is me carving out some time and taking the opportunity to share my messy, beautiful. I share it for the writing inspiration that is Momastery, writers and readers alike. I share it for my girls. I even share it for the opportunity to actually be a writer. But most of all, clearly, I share it for me. The eight millionth attention grabbing article headline came up on my screen today and sucked me in. You know the type. Fifty (or so) things you should do for this or that thing that ails you. I usually don't get sucked into the silly ones. But when the headline seemed to scream the words "30 Things to Start Doing For Yourself", I took notice. Because my messy beautiful life has become defined by one massive lesson; if you don't do what you should for yourself you cease to do much at all. Learning this lesson has required becoming a mother, losing a father, and finding a dream. Number three in the the list of thirty states, "Start being honest with yourself about everything". 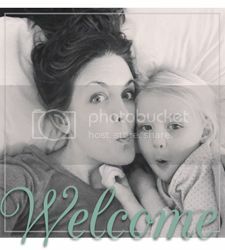 Wouldn't you know that motherhood forces that upon you like a gust of wind so strong, you inevitably land on your face at least once a day because of it? Before becoming a parent I was terribly egotistical about my chosen path towards child rearing. I have a child development degree, years of nannying and teaching experience, and no shortage of love for kids. On paper I am the person who should have become a parent. But everything is prettier on paper. I find it interesting when video clips and short stories attempt to share with non-parents what "it's really like" to have babies. Every last one falls short because there is no knowing ahead of time. There is no understanding. There is only the experiencing of it. My naiveté about what hides beneath the surface of who we are reared its ugly head soon enough. I woke up one day and realized I had strong, defining moments of being the parent I never saw coming. There was anger there and frustration so deep, it came through me like a wave. And yet, I trudged on anyway. Things got muddled in the diaper changing, the denied postpartum depression, and the never ending crying of newborn number two. I would see that nasty parent in myself, be afraid of her, and then walk away from her as if she were a figment of my imagination. I hadn't the time or the understanding to be honest with myself and change. Plus, I had no idea how to crawl out from under it all and make sense of anything. Instead I buried it and hoped the next day would be better. I prayed that I would learn to control whatever this was and leave it behind. I read books and blogs and believed it was just a tough time because I had two small children close in age. Then, as my oldest daughter started to look more and more like me, I was startled to see her looking at me one day in an all too familiar way. Her hurt feelings at something I had said read like my own childhood diary. Her face was a mirror of mine, reflecting years spent trying to understand harsh words and negative reactions. All of a sudden being honest with myself was all I could think about. Number eighteen in the list of thirty states, "Start forgiving yourself and others". Just after baby number two had her first birthday, her Poppy, my father, died suddenly of a heart attack. I say suddenly as if it wasn't expected. In terms of grief, it wasn't. But we all saw the writing on the wall. My grandfather died of the same affliction when my dad was seven. My dad was a walking time bomb of heart troubles and unhealthy habits. And yet, that loss and all that came with it stunned me to my core. I was thirty-two and forced to parent two very small children while grieving the loss of my own parent. You can imagine how well that went. My suppressed postpartum took a little over a year to become full-fledged depression, and my parenting suffered under the weight of the guilt and heartbreak. With much urging from those who knew my mental state, I got help. I could go on and on about how no one ever talks about getting help. Not really anyway. I could write my own very lengthy article about how terribly our society handles postpartum depression, grief, and mental instability in general. Instead, all I'm going to say is that getting help isn't the end all and be all. It's the beginning of something much bigger than that. It's the beginning of forgiving yourself and others. Very slowly I began to forgive. I forgave my dad for the parent he had been when his ugly side showed up. I forgave him for expecting too much, for thinking money meant love, and for the years of making me feel small. I forgave him for being absent at times and overbearing at others. I am still working on forgiving him for leaving too soon when he could have stayed. But, most of all I am slowly forgiving myself for letting his often harsh and hurtful parenting come out in me. There was nothing left but to forgive myself. I became a shell filled with the day to day necessities of life and nothing else. I had no choice but to chip away at my failed expectations of myself as a parent. I had no choice but to just be better. I deserved it and so did my family. Number eleven on the list of thirty states, "Start giving your ideas and dreams a chance". All of what I've shared so far is the messy part. It's the part that got me back on track to the beautiful. My life is incredibly lovely. I am blessed in ways I never knew possible. This is not lost on me. Tough times do not erase the most amazing parts that are still there. They just make it harder to clearly see the good…until one day the clouds start to part and, if you're lucky/determined/hard working, you see with overwhelming certainty that you've come a long, long way. I became honest with myself. I forgave others and work constantly to forgive myself. In there somewhere I found myself leaning on writing. I've written about all of this in some form or another since my dad passed. It became a constant saving grace. From day to day I don't know where I want it to go or what I want to do with it. That doesn't really matter yet. What matters is that it's given me a voice when I felt so silent, it was hard to breathe. It's taught me that realizing my dream of becoming a mom was just one of the many dreams I've always had. When we're little there's a lot of talk about what everyone wants to be when they grow up. Parents talk a great deal about what they want their children to learn from them. These things are great and all, but I feel like maybe we'd all be better off if we talked realistically to our kids about the hard things and the beautiful dreams. I want my kids to know they can overcome my failures and the failures of the parenting in generations before me. They don't have to live out the same story if they recognize the difficult parts are a necessary piece of it and rise above. I want my kids to dream a lot and dream big and then give those dreams a chance. It took a long time for me to call myself a writer. I've never published one word. But if I don't call myself what I want to be, how will I ever become it? Furthermore, I can't tell my children to follow their dreams without showing them how it's done. More than all of this, I want my kids to forgive me for my shortcomings and forgive themselves in the future. Life is too short, messy, and beautiful to live it in a place of regret. Here's to the messy and the beautiful both being important and necessary in their own ways. I commented on facebook, but I'll comment here as well. I love your writing...how open and honest you are. I love your willingness to share these thoughts and feelings and am so lucky to have you as a friend....you teach me so many things! Jana - I just love you a lot. The forgiving of myself is the hardest thing ever. Some days I can and other days I can't let things go and just beat myself up repeated for whatever I think I did wrong. But as you say - its a journey - its not about getting to one place its just about moving forward - always. I couldn't be more proud of you than I am right now, and couldn't love you more. The journey isn't always easy and often throws many unexpected curves that send us reeling through weeks of "what now"? You've come a long way, Baby, and your beautiful spirit and writing will help others to come a long way too. No more regrets. The journey is just beginning! Walk on, warrior of mine! I love you. Wow! I thought that was great! It is so hard to be open and honest and become vulnerable. But then it is such a good relieving feeling when you are able to do that. I realized after the fact that my kids had always heard everything I said. They did not play it back immediately, but over time - kids never forget. Probably the shortest book ever written is 'How to Be a Parent'. Thanks for sharing. Beautifully written, sweet Jana. I, too, lost my dad recently and definitely understand some of the sentiments you express here. Thank you for sharing your story.